It was that night that still haunts to this day. I remember it clearly. I remember her face, her voice, her touch, her eyes, and her presence. She was only a little girl, but yet still haunting and at the same time she was crying. It felt like a curse after she went away. Ever since then I'd get nightmares here and there. It was lonely. The dreams I had were terrifying, dark, sad, cold, and depressing because I was alone. This all happened when I was just a young boy curious to know what the internet has brought to this world. One night I wanted to discover what chat rooms were like. I've met different kinds of people. Some are good, some are bad, some are creepers, and some just looking to troll. I didn't know how awful human beings can be on the internet. There was one particular letter that I received in a chatroom. At the time I had no idea what chain letters were and I believed anything what was said on the net. It was past midnight when I received the chain letter, I read through it and was very scared about it. The letter talked about a story of a girl in the early 1900s being kidnapped, tortured, and buried alive by her kidnapper. Her body was never found until many years later her remains were discovered. They the area where she died you can hear her screams and cry late night. The letter then said her ghost would appear tonight in your room to haunt you if you don't send the letter to 10 people in 5 minutes. The problem is though in the chatroom the site doesn't allow you to copy/paste messages and it must be some sort of special coding. I begged the person who sent it to me to help out, but no response. He quietly left the chatroom. I was already past 5 minutes when I was trying to type the whole thing to send to other people to save my life. Few minutes later I told myself this isn't real at all. It's just a joke and troll people. Half of me says it is and half of me says it's true. I stayed up a little longer to make sure the girl didn't appear so I wore my cassette player listening to the radio and laid in bed trying to sleep. Things were normal throughout the night until about 2-3am. I wasn't sure if I was awake or if I was still dreaming. Everything felt so real and haunting. There was a cold aura around my bed and I can feel her presence above me. My body became paralyzed and still wasn't sure if my eyes were open or not. She was there. Watching me from the ceiling. I can still hear the music on my player and I started to sweat and wanting to cry in fear. My mouth would not open. I wanted to scream so bad for my parents, but I couldn't. I can barely breathe and felt her face coming towards me. It was something out of a horror movie. Her cold pale hands started to touch my body starting from my legs. I can see her smiling with those red haunting eyes. She had a dirty black curly hair, white clothing like a ghost, and her skin is pale white. 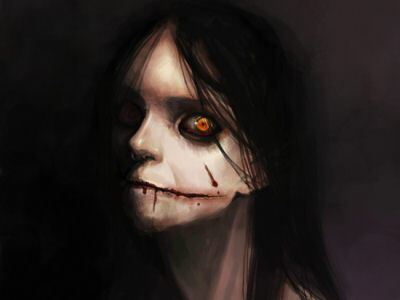 It was like she resembles the dead girl from movies such as The Grudge and The Ring. I couldn't believe the letter came true. She slowly floats over my body towards my face. The feeling was just surreal as she kept touching me. My body started to cramp and I can't feel my legs. I fought hard to move, but I just could not. I felt a pain within my legs like a scratch. I was feeling goose bumps as her cold aura surrounded my body. What is she going to do? She was trying to tell me something, but I couldn't hear well. This episode lasted for 30 minutes. My head was spinning fast and I wanted to get out of this nightmare. I have no idea what to do. She's just sitting there staring at me. I felt weaker and weaker as time goes by and there was nothing I can do. She suddenly cried as I struggled. Why was she crying? Did she felt bad about scaring me? I had no idea what was going on. She suddenly disappeared when I broke away the paralyzation. I checked my legs to see if there was a scratch and there it was. It was definitely real. I got out of my bed and turn on the lights and was filled with sweat. There were tears streaming down my face because I was really scared. I have sensitive feelings that I can easily become hurt from emotions. I opened my door and my cat Louie was sitting outside waiting to come in. I had him sleep on my bed with me for safety and peace. Ever since that night I still remember every detail of it and remember writing about it in high school. Nobody believed me, but that's ok. It's hard to convince others to believe your story. I felt that a curse was put upon me for some reason. I've had weird nightmares and dreams that have me feeling abandoned and alone. People push me away not being there for me. It's a weird feeling that it could be a sign or something. I do have moments in dreams that feel like Deja vu happening in real life. Maybe the girl possess me in some way. Maybe a miracle to keep others from getting kidnapped or in trouble. I've always brought good things to people I meet. I make them happy and I'm glad I do, but wondered how long it can last. Ah not sure what I'm even talking about. This story just stays in me for a long time. Anyways hope you enjoyed the story. You don't have to believe it or not, but it's true. We all have something that happened in our lives that sticks to our minds. Only yourself can believe the truth or not to not be haunted from it. Who knows? Maybe I'm already dead and just living as a ghost on the internet and protecting you guys.